What kind of food do you feed your pet? Are you having trouble picking out the right pet food to placate your pet’s sensitive digestive system? Or maybe your furry friend has grown weary of the same old diet and it no longer gets him or her excited as it used to, leading to poor appetite. I could go on and on because there are a ton on issues related to pet food and their importance in the growth and development of your pet. It is a no-brainer that the quality of pet food you purchase equals the health status of your pet. If you desire a pet food brand that adds an extra bundle of awesomeness as well as boosts the immunity of your dog then you may have been “barking up the wrong tree” however, with great pet food brands such as the Acana and Orijen brand, you can never go wrong. This review compares the Acana and Orijen pet food brand; both formidable and provides maximum nourishment for your pet. However, if you found yourself at a grocery store trying to make a decision on which of these two to pick from, which would you pick and what would be your parameter for making this difficult choice? We are going to help you make this decision by comparing both brands based on the most important characteristics such as nutritional value, cost, types of food ingredients and flavors, pros and cons, as well as safety of the product and more. This is your ultimate guide to choosing the right brand for your pet. 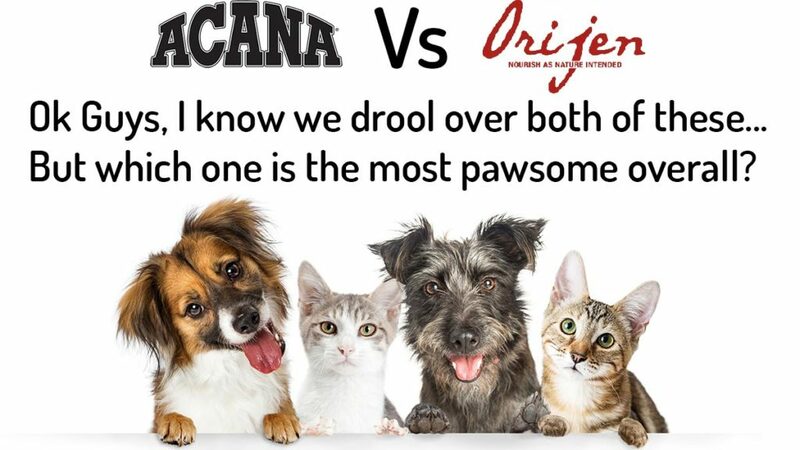 Orijen takes the lead with 42.3% and 45.8% on dry dog and cat food respectively whereas Acana keeps a close margin with 35.9% and 40% on dry dog and cat food. Orijen is significantly more expensive on dry dog food on per pound basis whereas the per calorie price difference is not so much. Which one has more flavors? Acana has an aggregate of 49 food types including recipes while Orijen has just 28 recipe and treat aggregate. Orijen has been recalled just once whereas Acana has never been recalled. Pet food types are mostly categorized as wet meals, dry food, and treats. Wet food contains natural flavors, ingredients, essential condiments and water content. This is different from the treats and dry foods which have little to no water content. From the analysis, Acana provides a wider variety of food types than Orijen, only limited by the absence of cat treats. Every pet food has a unique formula that is peculiar to the brand and every brand is mandated by the AAFCO to provide a guaranteed analysis report stating in accurate amounts the content of each pet food typical content of guaranteed analysis may include percentages of crud protein, crude fat, crude fibre, moisture, calcium, phosphorus, Omega 6, Omega 3, DHA, choline, magnesium, EPA, Copper, Zinc and other vitamins and minerals. The essence of providing a comprehensive nutritional content report is to enable pet owners to make decisions on which pet food is most healthy for their pet and which one contains the required amount of nutrients that pets need. Cats are mostly carnivores, and unlike dogs, cats thrive on a full protein diet, this makes these felines quite selective on what they eat. Other highly essential nutrients are fat and fiber. Let us compare the nutritional values of Acana and Orijen based on the three essential nutrients -protein, fiber, fat. Nutrient content is represented in percentages on the basis of dry matter(no moisture content). From the analysis both brands are well enriched with protein, fiber, and fat compared to many other pet food brands out there. Orijen contains more protein making it a very good choice for pets who are mainly on a protein diet. We can clearly see the amount in percentages for these nutrients in both food brands but what does this mean for our pet? How is this any good? What are the roles that these nutrients play in the lives of our pet. Protein is an essential nutrient that improves muscle fiber and adequate body build even in pets. The protein requirements of our pets may differ but protein remains one of the most vital nutrient in petfood. Dogs need all twenty two amino acids for development and metabolism. Only twelve of these amino acids can be synthesized in the canine’s system. The rest of the ten amino acids will need to be present in their diet to maintain regular body functions. Cats are no exceptions as well. Protein make up a higher percentage of a Cat’s diet compared to dogs. Cats require eleven essential amino acids in their diet to sustain good health through different life stages. Fats perform many roles in the system of both canines and felines. They act as a powerful source of energy, they regulate metabolism and body temperature, they are responsible for the absorption of fat soluble vitamins, they are essential in the production of immune boosters in canines such as prostaglandins. In cats, fatty acids may help in mitigating the spread of infection and can aid in the development of the optic nerve. Fats may even reduce the risk of heart problems in cats. Even though fats are quite helpful to pets, moderation is key. We must understand what percentage of fat is too much in order to maintain a healthy feeding habit. some may be curious as to why fiber is as important or even more important than other food components. The answer is very simple. Indigestion and other digestive system issues are quite popular in pets and have contributed to many trips to the vet as well as other secondary illnesses. A good way to mitigate issues related to digestive system in pets is to feed your pet an adequate amount of fiber. Fiber acts as a digestive component and allows your pet to break down various food types easy and fast. Both Acana and Orijen contain almost the same amounts of fiber. On average, how much do you spend on feeding your dog or cat? How much goes into purchasing that huge bag of kibbles and how long does it last before you have to scurry off to the grocery store for another bag? Do you keep track of your pet’s food expenses? Often time pet owners like to compare the prices of various pet food products especially when you are on a budget. There are a few ways to make price comparisons and to ensure that you do not exceed budget. It is always a relief when various brands are having a sale on pet foods or distributing coupons, as this automatically gives you a less expensive option. However, when comparing two different pet food brands in order to decide the most economical one to switch, it is best to use two of the most accurate metrics; per-pound (lb) and per calorie (kcal). Lets compare prices for Acana and Orijen. The metric, cost per calorie (kcal) is the most accurate as it measures the dry weight of the pet food. The cost per pound is influenced by the moisture content in the food. chicken giblets, catfish meal, de-boned turkey, pinto beans, green lenticels, whole green peas, turkey liver, dried lactobacillus acidophilus fermentation source, pumpkin seed, turnip greens, apples, carrots, sun-cured alfalfa, spinach, collard greens, butternut squash, herring oil, eggs, pumpkin, kelp and lots more. Turkey heart, chicken cartillage, chicken liver, brown kelp, marshmallow roots, cranberries, herring oil, chicken liver, whole eggs, chicken fat, carrots, green turnips, burdock roots, lavender, fresh pumpkins, butternut squash, whole parsnips, yellow peas, red lentils, milk thistle, and others. The award winning brand majors in the manufacturing of appropriate, biologically safe and nutritious pet foods for dogs and cats utilizing only the best natural ingredients rich in meat, poultry, and fish products. All products are manufactured at a world-class facility in Kentucky, America and Alberta Canada. Orijen is an industry leader in the manufacturing and delivery of premium dog and cat food all over the world. The brand was founded in 1985 by Reinhard Muhlenfeld, a dedicated pet lover. Since its inception the brand has improved greatly in its pet feed formulas and is now distributed to over 70 countries. When it comes to protein content, Orijen is definitely a better pick, however, Orijen ia more expensive, has less number of flavors and also has a history of recall. Acana on the other hand is economical, has no safety recalls and has quite a large variety of pet food flavors. Our winner for this segment is Acana!